I know it’s been a little longer than I expected it would be since my last post. This is due partly to the fact that I have been under the weather since before Thanksgiving. Which leads to the other reason for my delay; lack of content. 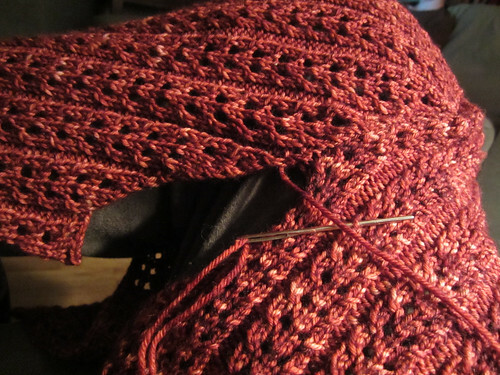 Knitting progress has been slower than I would have liked but more on that in a minute. What started out on late Tuesday as a minor breast infection, which for all of you who have breastfed know is common and easily dealt with occurrence, at least IME, progressed to something else altogether. On Wednesday and Thursday I had a low grade fever and symptoms of the afore mentioned breast infection. By Thursday night that was clearing up and my temp was back to close to normal. As Friday wore on though I started to get a weird swollen feeling in my throat. I figured it was my lymph nodes from the infection, until I lost my voice. My temperature went back up for the next 4 days and the upper respiratory symptoms worsened. My temperature was down some finally today but not totally back to normal. I have an annoying cough and still can barely talk. That is really frustrated I can tell you. I was really beginning to get concerned about the fever going on so long. I hate taking antibiotics unless they are absolutely necessary. I also avoid going to doctors if at all possible, but I knew I was going to have to go soon if my fever didn’t break. Hopefully I am on the mend now and it will continue to clear up on it’s own. I have been using vitamin C, zinc, and Echinacea to help boost my own immune system. Well anyway that’s enough about that, I am sure I will be fine. On to the Sprossling update. 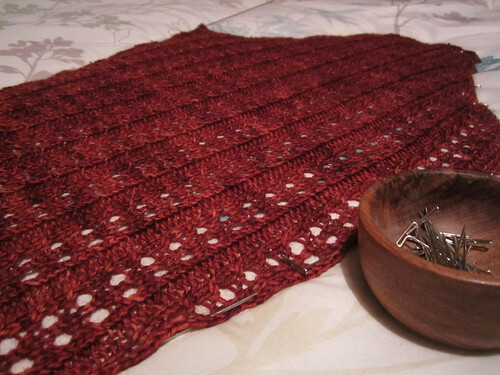 I finished the knitting yesterday. I apologize for the pictures since I was forced to take indoor shots last night and this morning, but I figured they would be better than nothing for now. 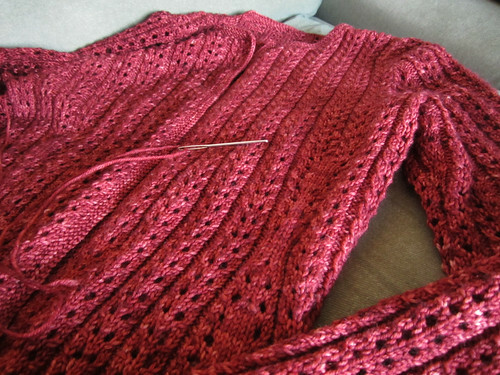 I soaked and got the sleeve blocking while I set to work seaming the left side last night. By about 9:00 pm the sleeve was dry enough and I got it set in too before quitting for the night. So all that is left to do is the arm and side seaming on the right side, as well as buying and sewing on buttons, and it will be finished! I am very pleased with it. The next post will most surely be of a completed Sprossling. Yay! On a sad note; I was very grieved to hear of the sudden passing of Karrie AKA knitpurlgurl. I met her several years ago at the Pittsburgh Knit & Crochet Festival and have followed her blog ever since. She always stopped in my booth and was very friendly. I guess we are always taken aback when one so young and full of life, with a young family to raise especially, is taken so suddenly. My prayers go out to her family and friends. I saw on her Ravelry group that they are doing a little something for the family if you are inclined to help out. Take care friends. Until next time.